Early in Shusaku Endo’s 1966 novel, Silence, the Jesuit missionary Sebastian Rodrigues, quotes Jesus in the Gospels: ‘He who confesses my name before men, him also will I confess before my Father who is in heaven; but he who denies my name before men, him also I will deny before my Father who is in heaven.’ Rodrigues’ quote is directed at Kichijiro, a Japanese Christian, and it is also an admonition, Kichijiro having previously apostatised, which is to say renounced his faith. This apostasy was not voluntary. In 1643, when the novel is set, Japanese Christianity has been ruthlessly suppressed, its followers maintaining their faith in secret, risking torture and execution if they are discovered. They are spared, however, if they are willing to publically apostatise, the act of which involves stepping on a sacred image of Jesus or the Virgin Mary. A specific object, called a fumie, is used for this purpose. Although it is through Kichijiro that Rodrigues and fellow Jesuit, Francisco Garrpe, arrive in Japan, their intention is to find Christováo Ferreira, their former mentor at the monastery, also rumoured to have apostatised. Rodrigues’s quote is one you might readily expect from a Jesuit missionary – an exhortation to spread the word of Jesus. To put it in crudely anachronistic terms, it’s about pushing the brand, and to deny or renounce Jesus is bad PR for the Church. Christianity, after all, arrived with commerce, and Japan’s regional lords initially embraced the new religion because it meant access to luxury goods like silk, and innovative new European technologies, chiefly those associated with warfare. The Japanese director Masahiro Shinoda adapted the book in 1971, with a script co-written by Endo. His Silence (Chinmoku) is explicit on this point from the start, the prologue describing the arrival of the Jesuit missionaries in 1549, ‘along with the gun’. For Shinoda the gun had a much deeper impact than Christianity, and he consequently shifts some of the focus of Endo’s book away from Rodrigues’s crisis of faith onto a broader historical and philosophical footing. Endo’s novel is told initially in first-person epistolary form, but Shinoda draws back from such intimacy, limiting the voiceover and thus our access to Rodrigues’s thoughts. The change of emphasis is starkest at the film’s conclusion, where Shinoda departs entirely from the novel, seeing in Rodrigues’s idealism little more than a masquerade for imperialism. For his part, Endo would certainly have understood Shinoda’s impulse. As a Japanese Catholic he travelled to France in 1950 to study literature at the University of Lyon. Here he encountered racial abuse and post-war anti-Japanese feeling, but also an imperial legacy rapidly disintegrating, with uprisings in Madagascar and Algeria. In Endo’s Foreign Studies (Ryugaku), published a year before Silence, a Japanese student sent to Rome at the start of the 17th century 'senses a contradiction between the true spirit of Christianity and the aggressive penetration into the Orient being perpetrated by the Christian Church in Europe at the time.’ Endo’s fiction would continue to wrestle with his peculiar personal inheritance, as he sought ways to reconcile his Eastern cultural upbringing and his Western Catholic faith. For Martin Scorsese, Endo’s struggle is analogous to his own attempts to understand faith in the context of the violent street ethic that shaped him. He first encountered the novel in Japan in 1989 after he’d finished filming The Last Temptation Of Christ. Given the predictable furore that accompanied that film’s release, his encounter with Endo’s story in Japan must have felt like a conciliatory sign to accompany his exodus, and it marked the beginning of his ambition to bring the book to the screen. Like The Last Temptation, Silence is preoccupied with the figure of Judas, personified in Kichijiro. In his introduction to the Picador Classic edition of the novel (2015), Scorsese writes that, ‘For me, it is the story of one who begins on the path of Christ and who ends replaying the role of Christianity’s greatest villain.’ In this fashion, Scorsese’s film draws away from Shinoda’s emphasis on the colonial component in the novel and back towards its spiritual dimension. By giving Rodrigues (Andrew Garfield) an extensive voice-over, he reintroduces the inner conflict at work in the character, and shows us how Rodrigues projects the role of Judas onto Kichijiro (Yōsuke Kubozuka) to better sharpen his sense of messianic destiny. When Rodrigues is captured and given the opportunity to test his faith, he tells the inquisitor Inoue (Issey Ogata) he is prepared for martyrdom, since “the blood of the martyrs is the seed of the Church.” But since the days of Ferreira, Inoue and the Japanese officials have got wise to this. Rodrigues’ faith will be tested, but not in ways that satisfy his vainglorious self-image. Right from the film’s opening sequence, in which Ferreira describes the martyrdom of priests at the volcanic springs in Unzen, the methods of torture are meticulously catalogued. Scorsese’s depictions, like those of Shinoda, are never gratuitous. Where Shinoda keeps the camera at an objectifying distance, Scorsese blends a variety of techniques. The scene in which Mokichi (Shinya Tsukamoto) and Ichizo (Yoshi Oïda) are martyred at sea mixes static long shots with close-ups and tilts that emulate the rhythm of the waves. With profound skill and sensitivity, Scorsese conveys the characters’ inner strength as well as their terror and suffering. As Rodrigues’s faith begins to waver, haunted now by his own admonition to Kichijiro about denying Christ, such torture inevitably bleeds into the absurd. It’s accentuated by the bureaucratic approach of the officials and the manner in which they coax the Japanese Christians into stepping on the fumie. “We are not asking you to do it sincerely,” they say. “It’s simply an act of formality.” Yet such reasonableness is punctuated by moments of arresting violence, committed exclusively for the benefit of the watching Rodrigues, who is never actually tortured, confined instead to a voyeuristic role, an audience of one for the grisly performance. 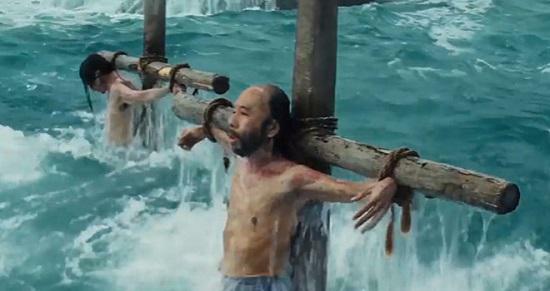 “The price of your glory is their suffering,” says Inoue, when Rodrigues still refuses to apostatise. This gets to the heart of the dilemma in the novel, what Scorsese sees as “the necessity of belief in conflict with the voice of experience”. Does the act of putting a foot on the fumie undermine belief? Does belief mean anything if it finds no expression through action? Is it possible to hold onto one’s beliefs while continuously committing actions that contradict them? Are there in fact moments when actions in contradiction of one’s beliefs have a paradoxical way of preserving and deepening those beliefs? 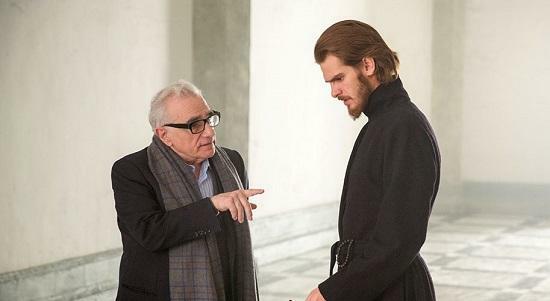 These are complex and troubling questions, and in attempting to dramatise them on screen, many critics feel Scorsese has over-reached himself, and as a consequence the film is inert, too long and downright boring. But what did these people expect from such subject matter? Billy Batts popping up in a paddy field demanding a shine box? Others point delightedly to the silence of the box office tills or the Oscar Academy, but given the decades it’s taken to get the film funded, this shouldn’t come as much of a surprise either. Silence is slow. Endo’s narrative has a corkscrew progression, part cyclical, and part linear, which makes it difficult to attach the usual variety of positive and negative charges that would accelerate the plot. And there are no choirs of angels or glow in the dark saviours to spice things up. It is what it is – an attempt to wrestle with faith in a realistic historical context. None of these criticisms detract from the fact that Silence is technically astonishing, every bit as accomplished as Goodfellas or Raging Bull. Each shot feels like the right shot, not just according to the scene’s expository demands, but in relation to it’s own internal language, a holographic awareness where each contains the whole. Then there is Silence’s remarkable aesthetic. Just as with the novel, the landscape becomes the exterior reflection of Rodrigues’s inner turmoil: the sea seethes and swallows; peasants sink deep into the monsoon mud; purgatorial mists disorientate and then dissolve in sudden moments of clarity; a cave comes to resemble the interior of a human skull; a boat moves through night fog like something out of a Val Lewton B-movie; a dolly zoom transforms trees into a cage for a prostrate Rodrigues; the sound of cicadas and birds fill the air like indifferent prehistoric static. It’s masterful stuff, the kind of filmmaking a mere handful of directors can aspire to, let alone achieve. And on final reflection, it’s also the kind of filmmaking that takes faith – in the power of cinema if nothing else.